Marketing Master Profile for Noah Kagan. What’s This? I’ve been using Noah Kagan’s SumoMe popup suite since I can remember. And I’ve taken advantage of the amazing deals for entrepreneur’s tools many times on his AppSumo business. Noah had to be one of my Top 15 Marketing Masters of the Digital Universe, he’s just too good to miss. He’s ranked #13 of the Top 15 and gets about 627,000 visits a month. Kagan’s site is a little less reliant than the average Top 15 Master on SEO. He gets 30% of his traffic from SEO rather than the 44% that is average. He makes up for it with above average traffic from Direct (37% vs 31%), Social (15% vs 8%), and Email (16% vs 5%). He’s #2 out of the 15 with that email number–only Brian Dean beats him. Is this due to his big AppSumo email business? It’s almost entirely a function of email and he is constantly bringing great new offers to your inbox, so that’d be my guess. Kagan’s content quality scores are right at the averages. Looking at the SEO scores, I see a couple of things. First, Kagan is bringing high quality links. Second, he is hitting the averages with keyword targeting when we look at the traffic per keyword. What we don’t see is conversion rates. Kagan may not care about generating bulk traffic if he’s particularly good at generating traffic that converts well. Kagan gets well above average traffic from Social Media. His mix is highly skewed for Facebook and Twitter. 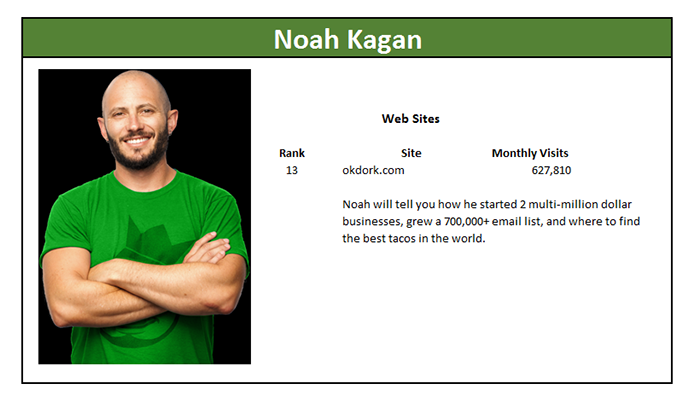 Congratulations Noah Kagan, and welcome to the Top 15 Marketing Masters of the Digital World!